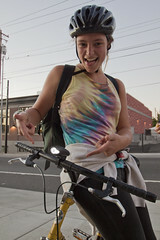 On Wednesday, September 28th, we kicked off our Get Lit events for the fall with a light event at NE Weidler and N. Williams, where there are several bike lanes that merge and cross paths, with several lanes of traffic on both streets. Last year, the City of Portland made some bike lane improvements at this intersection, with a sidewalk cut in at the intersection, which allows bicycles to essentially line up on Williams to head North. We were set up by dusk at 6:30pm, with 100 sets of lights, one staff and seven volunteers. We set up signs, blinking lights and we were prepared with screw drivers and surveys. Before we could even grab some lights, we had a line of 5 unlit cyclists waiting to get lit. The flow continued for the next hour and a half. We installed lights on 62 unlit cyclists, making the roads safer for everyone. We had some great conversations, met some folks who had bought bikes at our shop, and had a chance to talk to Central City Concern residents and staff, since we were staged on the sidewalk in front of their Madrona Studios apartments. The event ended around 8pm, once the bicycle traffic had slowed to a trickle. We loaded the supplies back up into our cargo bike and headed back to the shop, eager for another random act of safety at another intersection in the future. To see more photos from Get Lit, please check out our photo album here.